LONDON (Reuters) - An "army" of 2-metre-high (6.5-foot) statues has been assembled in the courtyard of a former royal palace in London to welcome visitors to an African art fair. 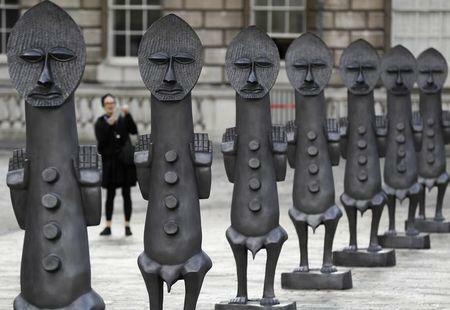 Something of a cross between China's terracotta warriors and the Easter Island monoliths, the 40 stern-faced black figures dominate the neoclassical entrance to Somerset House which is hosting the 1:54 Contemporary African Art Fair. The work of London-born artist Zak Ove, the installation "Black and Blue: The Invisible Man and the Masque of Blackness" is meant to recall a play performed at Somerset House when it was the home of the wife of King James I in the 17th century that featured players in blackface makeup. "The installation comments on the relationship between power, beauty, identity and skin colour," according the organisers of the show, which includes paintings, sculptures and photography by a range of artists. The 1:54 exhibition, named after the number of countries in Africa, runs from Oct. 6 to Oct. 9.